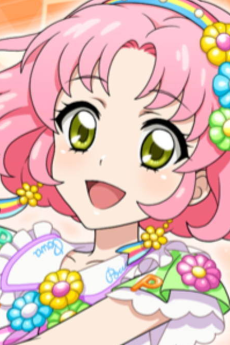 Sakura Kitaoji is one of the eight main characters in the Data Carddass Aikatsu! game and the related anime adaption. She was one of the four girls that were first shown in the first opening for said anime; however, her official debut in the series itself was in Episode 26. The primary brand that Sakura uses is Aurora Fantasy. As of Episode 38 of the anime, she is a member of Powapowa-Puririn, an independent idol unit consisting of herself, Otome, and Shion. Sakura comes from a famous kabuki theatre troupe family and as a result has learned many ancient Japanese arts ever since her childhood. Like the other members of her family, she has the genetic habit of breaking into theatrical performance when experiencing strong emotions known as the "Kitaoji Theater".